There’s just something about waking up to loud claps of thunder and pouring rain that makes me want to cover up and burrow in to listen. It is the musical overture to my morning thinking. The prelude to my day. That’s what I woke up to this morning. Then the rain slowed and the birds began chirping again. Bringing their own music into the mix. I photographed this dragonfly the other day. The dragonflies are often still for minutes, allowing me to photograph them clearly. Unlike the hummingbirds. Yesterday afternoon I saw the hummingbird twice. I grabbed my camera and tried to capture it. All I saw were prismatic jewel toned feathers flickering in the light. The only time it slowed was when it paused in the air for just a second, wings fluttering so fast I could barely discern motion, then it darted away. About a week ago I trimmed the white petunia plant way back. There was not a flower left. And within days it had recovered and the petunias were blooming again. 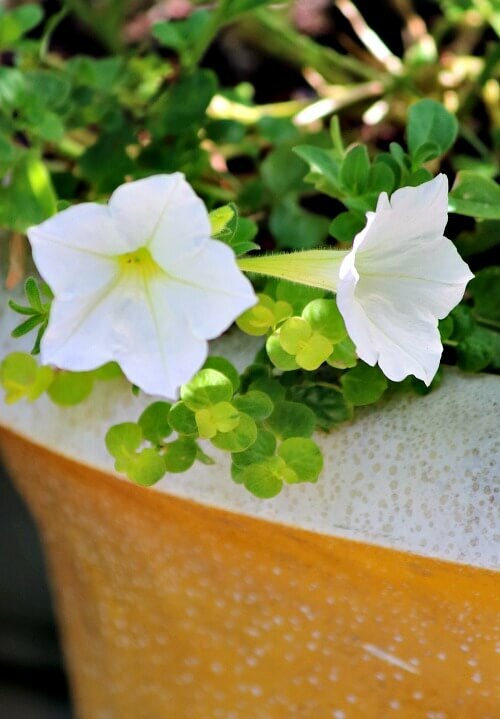 You just can’t find many plants with the durability of petunias. Well, except for purslane maybe. Which you can walk on, drag things across and even worse, and it just bounces right back. So the lesson here is, when your flower stems grow long and leggy, cut them back. Allow them to renew their energy. They will bless you with new flowers before you know it. It is quiet now. The calm after the storm. Everything I see out the window and front door is still as can be. You wouldn’t know the wildness of the rain storm just an hour ago. But then that is the essence of nature. Its quixotic moods are many and often transitory in duration. 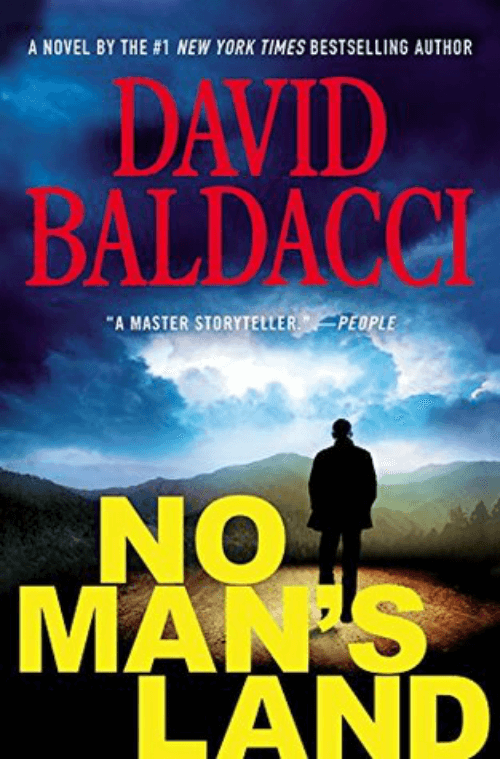 I am currently reading “No Man’s Land.” I love David Baldacci’s books. I picked this one up on the clearance table at Barnes & Noble. Great photo of the dragonfly, Brenda! For some reason I find them hard to capture for a photo. The ones I’ve seen lately on my patio act like they’re drugged or something. They just land on something and don’t move for awhile. I like listening to the rain falling at night and in the early morning hours as I’m snuggled under my blanket, too. I nearly always sleep with a window in my bedroom cracked slightly open, so I hear the sound of the rain more clearly when it does rain. I remember doing this for – as far back as I can remember. Something about being safe and dry and warm inside, snuggled in a comfy bed with cushy pillows and soft linens? I noticed the same thing about the dragon flies I’ve seen around here, too. And the lightning bugs have totally disappeared. This is far too early for that to be happening, but I think it might have something to do with the record-breaking heat and high dew points (in the mid 60s to mid 70s – VERY thick air, hard to breathe) we’s continually experienced here this summer. It’s been rain short here, too. The storms you had are headed our way. But they’ve been saying that for days now, forecasting some rain each day for a week, and we only got some brief rain – not even enough to wet my fences all the way, one day this past week. So, we’ll see if tomorrow we get the storms promised. We need the rain. On an up note, a volunteer petunia appeared about 10 days or so ago. It must have been growing slowly in a corner of the south front garden bed, too shy to come out, under mostly shade from a purple sand cherry and hiding in the shadow of a peony bush. It’s pink. Last summer I had red and white petunias planted in that bed but did not put any annuals in this year. And then the pink petunia appeared. It’s had 4 flowers on it now, LOL. So unexpected, and so delightful. So I’m making sure I water it every few days because’s it stays pretty dry underneath the eaves . I wonder if it’s a hi-bred from red and white petunia seeds that somehow survived to produce one pink plant this year? Or if it’s a seed from a pink petunia from someone else’s yard? I’ll never know, I guess. Lucky you with the volunteer petunia. Maybe it comes from the red and white, and maybe it just came up of its own volition. We got a lot of rain here. 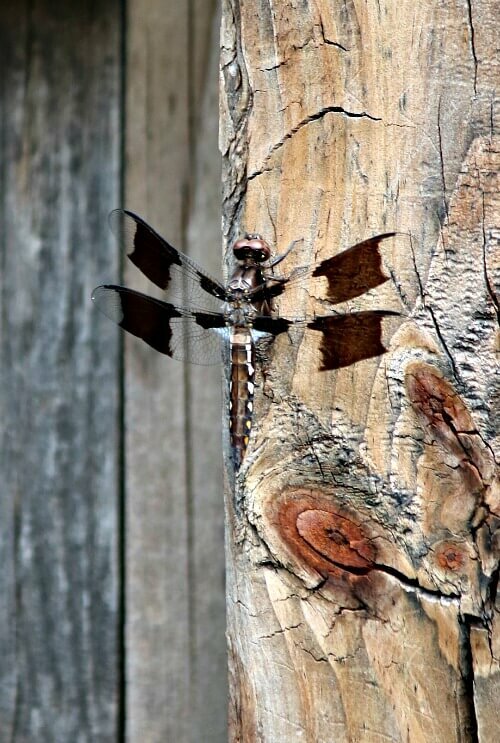 Love the dragonfly photo with the textures and contrast. Have a great Sunday with Charlie! 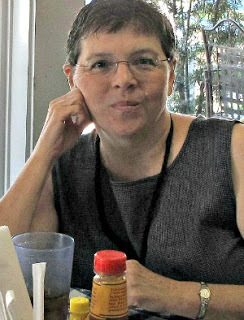 Brenda, I truly think many of your photos are unsurpassed in blogland and beyond! We have had a good rain here, too. It’s nice to see green grass in August. Blessings to you and Little Charlie. Well, thank you! I take photography very seriously. I just point and shoot on the automatic setting though. Many think you should learn to do it all and kind of feel scorn for the automatic setting. But it’s simple and I’m pleased with the results. Your photography & writing skills are awesome!! Love your blog!! I thank you for the compliment! I agree that your photos are top notch! I am amazed that your petunias hold up in the heat, they sure don’t hold up in my area of Florida. My lantana and some low growing zinnias are doing well. My passionvines are thriving and my morning glory looks good. The morning glory only grows from a cutting, it doesn’t produce any seeds. I finally saw a couple of dragonflies lately! We got a doozie of a thunderstorm this afternoon, we really needed the rain. Have a nice evening. I am home with 2 kitties and my Yorkie, Dixie. My zinnias gave up the ghost quickly. For some reason that always seems to happen to me. The lantana looks good. And the petunias look okay but the black and purple and red ones are being eaten. Oddly not the white ones so far. I agree that your photos are fabulous! What’s the name of the spectacular flower/plant in the first photo? 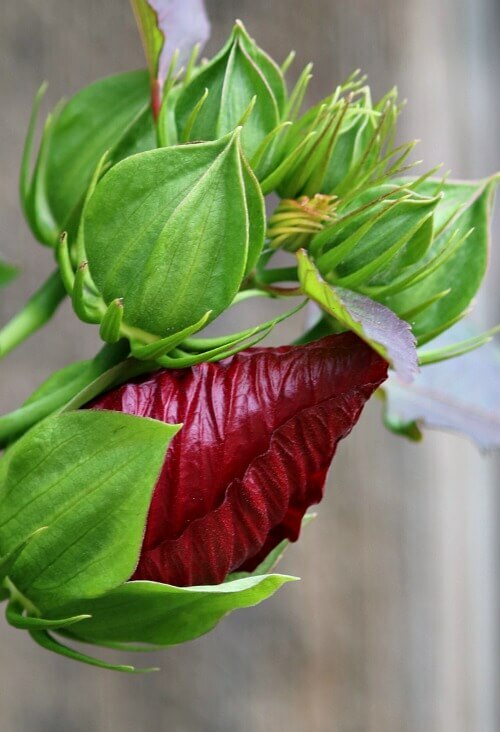 It is a hibiscus just about to bloom. Wow, those photos are fantastic, Brenda! 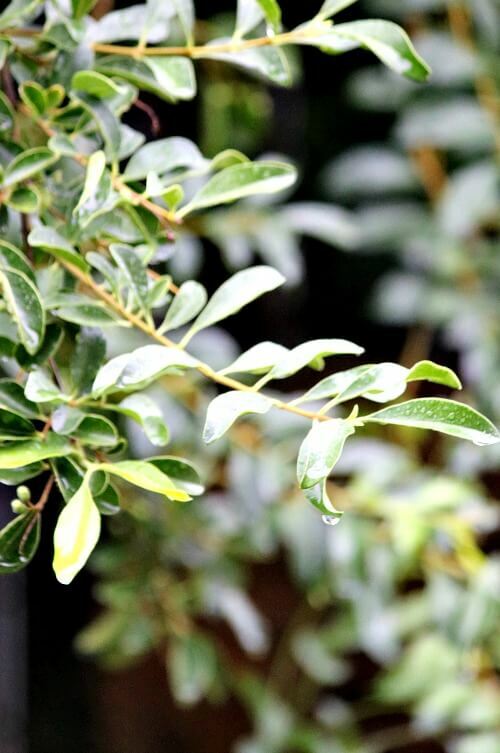 I love the sound of rain, too! I probably should have trimmed my plants back – they’re definitely leggy! Trim them to make them bushier. You don’t want the energy going to the leggy ends. I was out dead-heading my petunias this evening and contemplating whether I should cut them back or not. The are pretty leggy. Guess I’ll go for it tomorrow after reading your post! I love petunias because of the various colors they come in. The pot I was thinking about dead-heading has these hot pink and purple petunias in it and the particular shades of those two colors are so pretty together. I’m going to let a couple plants produce seed and see if I can recreate the combination next spring. Beautiful shot of the dragonfly. Now if those doggone little hummers would just cooperate! I was wondering when they start to migrate south for the winter. I just got a hummingbird feeder and wondered whether it was worth hanging out this late. Do you know? I’m further north than you, so it’s probably different for or different locations, though. Geez, I gotta close and go to bed! Hope you and Charlie are having a restful night. ‘Til tomorrow. I don’t know much about hummingbirds. Except that they’re driving me crazy trying to get a photo of them! I haven’t gotten petunias for years because of how they get so spindly. So I now know to trim them back so they look better. I’ll have to try them again. Thanks for the tip. Rainy mornings make it really, really hard to get myself up out of bed and to the office!! I would love to just curl up and read a book for the day…..sigh.